We made some fairly major changes to our company structure to best serve our growing list of client partners. Lessie Poyner joined our team as our first VP of Customer Success. 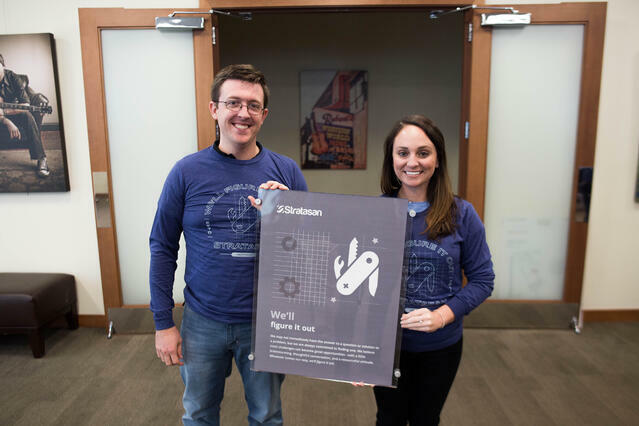 We created new positions dedicated to innovation and continuous product improvement, promoting two long-time Stratasan employees to lead these efforts (Hank Neuhoff and Morgan Atkins). We expanded the Tech team to include members dedicated to product development, data services, and internal ops. Our product team expanded to accommodate our active product release plan and our data team grew to meet the increasing customer demand for analysis and QA. October 17 marked our first company Town Hall. 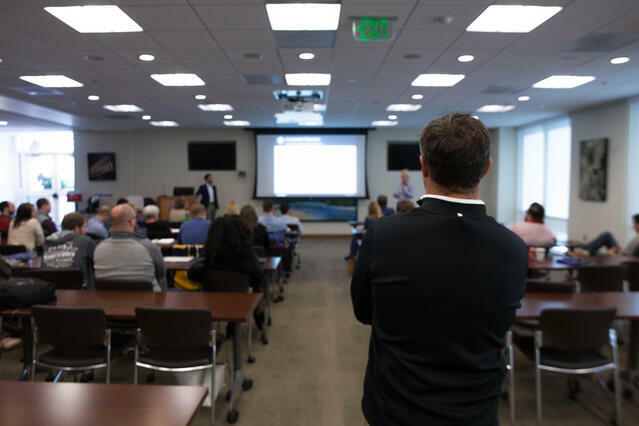 As one of the founders of the company, this was an incredibly special event as several team members presented throughout the day, providing progress updates and, more importantly, their vision for our future. We also announced our first alteration to our core values. “We’ll Figure It Out” is a fairly common phrase within our walls. The level to which it has permeated our team approach toward problem solving, and especially how it has impacted the discussions we have with our client partners, is something that continues to inspire us to grow and be better. As we heard this phrase organically more and more throughout the year, we recognized it was time to look at how it compared to our current core values. We decided to replace the value “Punch Above Your Weight Class” with our new one, “We’ll Figure it Out,” with the intention of encouraging our team to always pursue personal growth while pushing the team and our clients forward. Rounding out this year in a special way, on November 1, the Nashville Business Journal announced their inaugural class of Employee of the Year. Stratasan’s Director of Innovation, Morgan Atkins, was named to this list in the Company Culture category. And as I look back on 2017, our most impactful illustration of growth can be seen through our content, as we’ve found our unified voice and honed our ability to share our ideas. These efforts have been led by Jennifer Keller, Haley Devlin, and Elizabeth Duffield and have been a great exercise in learning from each other and our clients. Reading through our blog posts and newsletters, there is a reoccurring focus to empower our clients to make better strategic growth decisions via our software applications and professional services. The entire team has come together and continues to contribute their expertise with the goal of furthering our own and our client’s understanding of today’s landscape. In summary, as we wrap up 2017, it has never been more exciting for me to be a part of the Stratasan team. My personal hope for 2018 is that we continue to be inspired, and to inspire each other, both internally and externally with our amazing client partners.